Happy May! I'm getting really excited about the summer. Having my kids home for an extended time, swimming, great fruit, and homemade ice cream are just a few things I love about the coming season. I was looking through old pictures and came across a couple of great ones that begged to be shared. 2006---My cute little children excited to swim! Morgan is 4 in this photo. 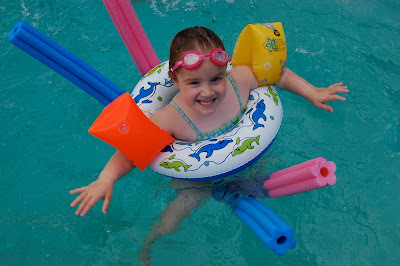 You better believe she wasn't going to sink! Do you know what is the best way to kick off summer? Memorizing scripture!! I knew you would be excited, too. I hope you are enjoying the journey so far. When you look back at the verses you've taken in so far this year, I pray it lifts your spirit and makes you smile. I am SUPER proud of you for sticking with it this far!! To be honest, I'm pretty proud of myself, too. This last week I had to barter with myself a little bit in order to get my reviewing done. It looked a little like this: Angel, you can not turn on the radio in the van each day until you've reviewed your memory pack. Or... Angel, you have 10 min until your next meeting. See how many verses you can review before your appointment. There are others, but most are too silly to share. And, yes, I do talk to myself... often. I've been in a time of a little discontentment with a few areas of life, so I'm going to focus my thoughts and meditation on his provision for the first half of this month. This passage also speaks to what I've been learning about caring for people around me. Isn't it interesting that I have been discontent AND learning about caring for others? My heart can be so contradictory sometimes. This may take me through the whole month, but it is a fairly familiar passage. I will update my progress on the 15th. Matt 5:7-12 Ask and it will be given to you; seek and you will find; knock and the door will be opened to you. For everyone who asks receives; he who seeks finds; and to him who knocks, the door will be opened. Which of you, if his son asks for bread, will give him a snake? If you then, though you are evil, know how to give good gifts to your children, how much more will your Father in heaven give good gifts to those who ask him! So in everything, do to others what you would have them do to you, for this sums up the Law and the Prophets. Like I said, I know it's a lot. It will probably take me all of May. We'll see. Maybe I'll barter something really great with myself if I learn it in the next two weeks! I'm really excited to read what you will be memorizing for the 14 days! And, summer does not mean a break! It doesn't matter that you are out of your normal routine. It doesn't matter that it's too hot. It doesn't matter that you are traveling or vacationing. It doesn't matter that you are mentally spent. God's word remains true, established, life-changing and worth you pushing past any excuse you can muster! Take any extra time that summer may bring to memorize an extra verse or review an extra time. Stay the course, friends! 17 important comments so far. What are your thoughts? I'm continuing to learn that I cannot please the world because it is not where I belong! My life is hidden with Christ! Thank you, Jesus! Who comforts ,consoles and encourages us in every trouble calamity and affliction, so that we may also be able to comfort those who are in any kind of trouble or distress, with the comfort with which we ourselves are comforted, consoled and encouraged by God." With what measure I meet, it is measured unto me. I sow bountifully in mercy and love, and therefore I reap bountifully. Right now, my mind is on learning how to give comfort and kindness and encouragement to others, because that is exactly what Jesus has done for me. "I will remember the deeds of the Lord; yes, I will remember your miracles of long ago." "Surely in vain I have kept my heart pure and have washed my hands in innocence...Whom have I in heaven but you? The earth has nothing I desire besides you. My flesh and my heart may fail, but God is the strength of my heart and my portion forever." "In their own eyes they flatter themselves too much to detect or hate their own sin." Ouch! I hope and pray that such a statement is not true of me. God, reveal my heart! I still need to work on my April section, too :-). This one was strong in my heart while praying for Cord of Hope. It's long, but I feel like if I leave any of the verses out, I'm short-changing myself! So from now on we regard no one from an worldly point of view. Though once we regarded Christ in this way, we do so no longer. Therefore, if anyone is in Christ, he is a new creation; the old has gone, the new has come! All this is from God, who reconciled us to Himself through Christ and gave us the ministry of reconciliation, that God was reconciling the world to Himself in Christ, not counting men's sins against them. And He has committed to us the message of reconciliation. We are therefore Christ's ambassadors, as though God were making his appeal through us. We implore you: Be reconciled to God! God made Him who knew no sin to be sin for us, so that in Him we might become the righteousness of God. Jesus therefore said to them, "Peace be with you; as the father has sent me, I also send you." Love you all and enjoy peeking through a little window in your heart, through the scriptures you are memorizing...Enjoy praying together tomorrow, know I will be with you praying, even if I am far away! Ang- I like the snazzy new webpage... wink, wink!Love you! I really need to get on my memory verses from last month. So, I'm gonna start with those. But, this verse really jumped out to me tonight and I am definitely going to take the time to memorize it this month. "Remember my affliction and my wandering, the )wormwood and bitterness. Surely my soul remembers and is bowed down within me. This I recall to my mind, therefore I have hope. The LORD'S loving-kindnesses indeed never cease, for His compassions never fail. They are new every morning; Great is Your faithfulness. The LORD is my portion," says my soul, "Therefore I have hope in Him." The LORD is good to those who wait for Him, to the person who seeks Him." My dear brothers, take note of this: everyone should be quick to listen, slow to speak, and slow to become angry, for a man's anger does not bring about the righteous life that God desires. Therefore get rid of all moral filth and the evil that is so prevalent and humbly accept the word planted in you, which can save you. I was reminded of this verse recently and realized I hadn't ever fully committed it to memory. Looking forward to really taking it in. I was m.i.a. for the second half of April, but didn't stop memorizing! I needed to work more on the verse I had posted in the beginning of the month, as well as work on the references for the verses I've memorized so far. So, I'm back and looking forward to May's memorizing. I am going to be focusing on this passage for the next month, but will post my progress on the 15th. I just love referring to Jesus as our advocate! "For you will not delight in sacrifice, or I would give it; you will not be pleased with a burnt offering. The sacrifices of God are a broken spirit; a broken and contrite heart, o God, you will not despise." The steadfast love of the Lord never ceases; his mercies never come to an end, they are new every morning; great is your faithfulness.